Preheat oven to 425°. Melt butter in saucepan; add flour, salt and pepper. Blend, then add cream and bouillon. Stir constantly. When it thickens, add sliced mushrooms, seafood and mustard. Add a little of this mixture to well beaten egg; gradually add all mixture to egg. 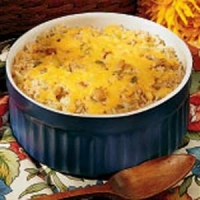 Put in casserole or shells. 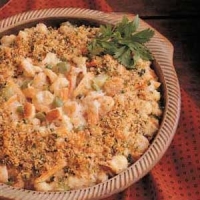 Top with buttered bread crumbs. Place in oven for 20 minutes. Add all the sherry when mixing ingredients. Serves 6.